Performed ‘That Kinda Day’ to #ThornyRoses a dance performance (by Korede and Nnenna) at The Avalanche Kings of Dance held at the MUSON Centre on 27th December, 2015. In attendance were Mrs. Buhari (First Lady Of Nigeria) and Mrs. Daisy Danjuma (who later by text said the performance was very well done). A Poetry Show titled ‘ Things We Cannot Tell’ which Donna Ogunaike organised in partnership with Freedom Hall. Featured were Donna Ogunnaike and Dike Chukwumerijie as poets and had musical performances by many talents including Tarri The Guittarri. Event was held on 20th March, 2016 . Performed ‘Touch’ at the ‘Lagos Business School’ on 22nd May, 2016. Audience was very diverse, with many expatriates in attendance and many tears were shed. Speaker at the Cape VI Africa Conference, Abuja on 16th March, 2016. An event so important that the Vice President, as well as the Minister of Petroleum Resources were in attendance to open the conference. Panelist at Dabira’s Conference ‘Finding Your Inner Genuis’. Session was on ‘Breaking The Silence’. Lectured at the Centre for Petroleum Information. The topic was “Legal Limits and Protective Measures in Renegotiated Contracts in Light of Currency Fluctuations’ at Oriental Hotel on 20th May, 2016. Only woman on team of facilitators. Teaching/Facilitator at LKS Seminar. On the topic ‘Understanding and Negotiation of Oil and Gas Contracts’. On 11h November, 2016 at Oriental Hotel, Victoria Island Lagos. Featured in the International Alliance of Law Firms Newsletter speaking about balancing poetry and law. ‘You’ve Always Had it in you’. First Personal Theatrical Production ‘Love Like Slave’ on 27th and 28th February, 2016 hosted by Lagos Theatre Festival / British Council . Performances in Poetry, Music, Dance and Painting. Recorded ‘Sweet Music’ with Audu Moses on New Years Day, 2016. Featured in Google Doodle celebrating the International Women’s Day. Portions were aired on CNL and my scene was featured prominently. 8th March, 2016. Interview with CNBC Africa, following my presentation at the Cape VI Conference. Interview with NTA International on 21st March, 2016 celebrating the World Book Day with poetry from Donna Ogunnaike and Bash Amuneh on 21st March. Featured in Suluzulu Africa Online Magazine on29th September, 2016. Over 300 reads. Featured in Obiwon’s Album ‘Floodgates’ with a poetry piece ‘A New Beginning’ launched on November,12th 2016. Recorded ‘Mopelola’ with Oba. Yet to be released. Playground named in my honour in Port Harcourt. 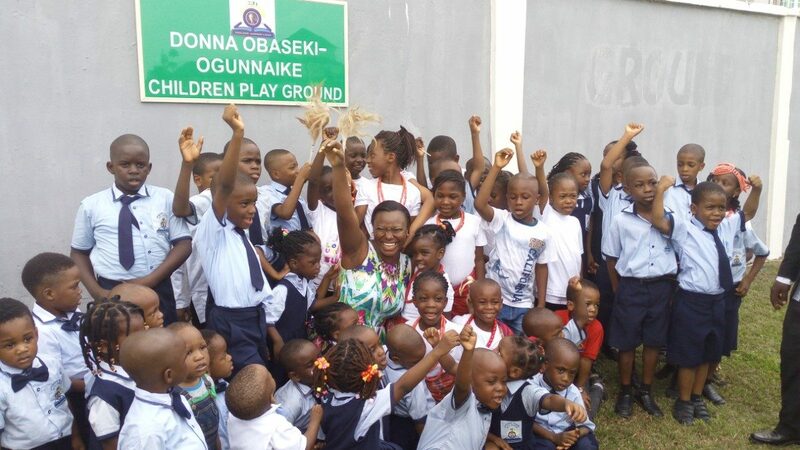 On 19th November, 2015 I went to officially launch the ‘Donna Obaseki‐Ogunnaike Children Playground’ at Yitzhak Rabin International School. News, updates, and more, directly in your inbox! © 2019 Donna Ogunnaike. All rights reserved.